his bit of information comes from @evico on Twitter who’s been on top of things as of late! You can read the complete Press Release here. 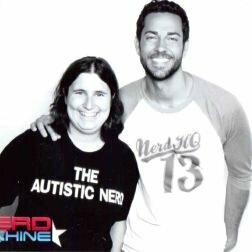 NEW YORK–(BUSINESS WIRE)–Break Media, a leading creator and distributor of digital video content, today announced a new partnership with Zachary Levi and “The Nerd Machine” to produce a series of videos and events at the 2011 Comic-Con International Convention being held in San Diego on July 21-24. Break Media and Levi, along with his celebrity friends, will work together to create original videos to be launched at “Nerd HQ,” a home base at Comic-Con for fans and famous faces in nerd culture. Leading up to the four-day event in San Diego, Break Media will produce and distribute three parody, nerd-themed public service videos, to be promoted on Break.com and on a custom Nerd HQ channel throughout the month of July. Live updates from the Nerd HQ event at Comic-Con—including photo galleries and highlights from celebrity panels—will be featured on the online channel and through editorial coverage across various Break Media properties including Game Front and Screen Junkies. In the last year, Break has expanded into the 34th-largest web property and a top-five video ad network in the US, streaming more than 2 billion videos each month. Break.com is currently the top comedy destination on the web according to comScore, and the company has also ramped up its original video production arm, putting itself on track to produce thousands of original videos this year. The partnership with Levi comes on the heels of the company’s recent hiring of entertainment industry veteran Greg Siegel as SVP Entertainment Development. Siegel manages Break Media’s entertainment partnerships as the company ramps up in-house original video productions. This entry was posted in SDCC, The Nerd Machine, Zachary Levi and tagged Charity, comic con, nerd, SDCC, The nerd machine, zachary levi. Bookmark the permalink.